Tennis – Enjoy tennis around the clock on the two lighted tennis courts. Rackets are available for use on the tennis courts. Golf – Enjoy golf at world class golf courses. 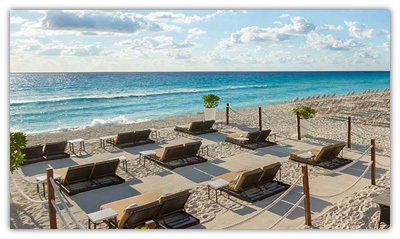 Tee times, lessons, club rentals and more may be reserved prior to arrival through the staff at Hard Rock Hotel Cancun. 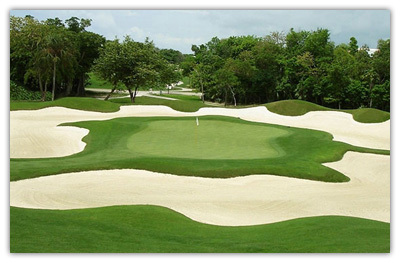 Play at Riviera Cancun Golf Club, home to a beautiful 18-hole Jack Nicklause designed course. Another recommendation is The Golf Club at Playacar, featuring a course designed by Robert Von Hagge. Pools – Frolic in the exotic outdoor lagoon-style pool. Enjoy the tropical setting as you lounge and enjoy the food and beverage service. There are two swim up bars to offer service while you cool off in the water. Lounge chairs and poolside towel service is also included. Family Activities – There are plenty of activities to keep your family going all through the day. From beach volleyball and playing in the pool, your kids can get out of the sun and visit the game room. The game room offers: game consoles including Wii, Xbox, and Xbox 360; pool table, ping pong, foosball, air hockey, trampoline, movies, and a Disco for ages 13-17 (available during high season). Kids Club – Your little ones will enjoy the Kids Club, available for children 4 to 12 years of age. Schedules of supervised activities are available and include kid’s pool and slides, trampoline, video game room, mini-cinema, singing, dancing, building, dress up, and enjoying other activities with favorite childhood characters Thomas & Friends, Barney, Bob the Builder, and Angelina Ballerina. Fitness Center – The gym is fully equipped with cardiovascular machines, weight machines, treadmills, stepping machines, bicycles, and free weights. Sauna and steam bath are also available. Exploration and Site seeing – There are several Mayan ruins and exploration opportunities in the region. Site seeing venues offer vacationers several options: Xcaret with its underground rivers, diving, snorkeling, and coral reefs; the natural aquariums at Xel-Ha; the ancient Mayan port of Tulum containing many curious buildings; the villages and cities of Puerto Morelos, San Miguel, Playa del Carmen, and Cancun. Bicycles can be rented in some of these areas. 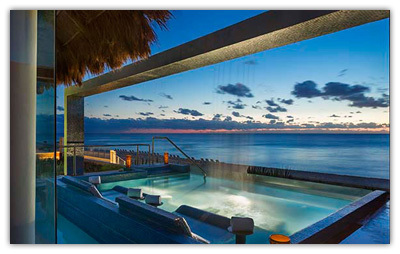 Spa – The Hard Rock Hotel Cancun has a great menu of massages, facials, and body treatments. Indoor and outdoor treatment rooms are available for both couples and individual treatments. Treat yourself to an unforgettable spa experience as you relax in style. Shopping – Check out the lobby shops at the Hard Rock Hotel for many essentials and interesting souvenir items, including signature Hard Rock merchandise. Shopping is a delightful experience in this part of Mexico. 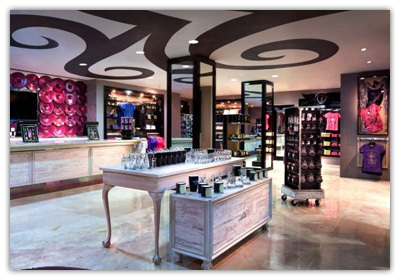 Throughout the Cancun region you’ll find products and services in duty free shops, jewelry boutiques, fine gifts store, and logo and sundries shops. You’ll find merchandise from Mexican artisans throughout the country. Shop for Mexican handicrafts, hammocks, silver, clothing, shoes, black coral products, and much more! Diving & Snorkeling – Pure, transparent waters make for spectacular diving and snorkeling. The nearby coastal waters of Cozumel Island have remarkable clarity, and the waters are alive with colorful coral and many species of marine life. Dive masters allow you and other divers to choose your reef, depending on your experience level. Novices will enjoy Paradise Reef for the many shallow patch reefs, large brain coral, sea fans and sponges. Intermediate divers may try Palancar Caves or Columbia Wall and encounter big grouper, playful green moray eels, eagle rays and turtles. For the very experienced, Maracaibo Deep and Barracuda Reef are as alluring as they are challenging, where giant orange elephant ear sponges, black coral, large schools of fish, turtles, rays, and even hammerhead sharks may be spotted. Excellent snorkeling is available in many locations, even very close to the hotel itself. Deep Sea Fishing – Plan a fishing trip to nearby Cozumel Island, which boasts some of the best fishing anywhere. Several fishing excursions are available, depending on what you are fishing for. Crews can filet and package your catch to take home. Excursions include fishing equipment, tackle, bait, snacks, refreshments, and pick up and drop off. Entertainment – Enjoy live music and entertainment, nightly shows, and theme parties.